our backs, even if only for a little while, and we are revitalized. That’s what it feels like for me in any case. blessed fact that I actually have a choice on Saturdays. one of my favorite ways to “decompress” from the week passed. was one such Saturday lunch. salt and 1 teaspoon of the pimenton. subsiding, add the garlic, letting this sizzle for a bit but not get brown. flip them and cook on the shell side. out with a spoon and set aside. – Melt the remaining 1/4 cup of butter in a small pan or in a bowl in the microwave. Set aside. wedges and the bowl of melted butter on the side for those who want more. Serve and enjoy immediately! this until after she saw my bandaged finger! despite the cool-for-us weather) it was just the thing. Scrumptious! That is one of the best combos ever. A classic. I love Saturday mornings! That's also the time when my daughter and I wake up a little later than usual because there's no school! garlic, butter and shrimp- it's a a wonderful combo! Perfect for lazy saturdays! 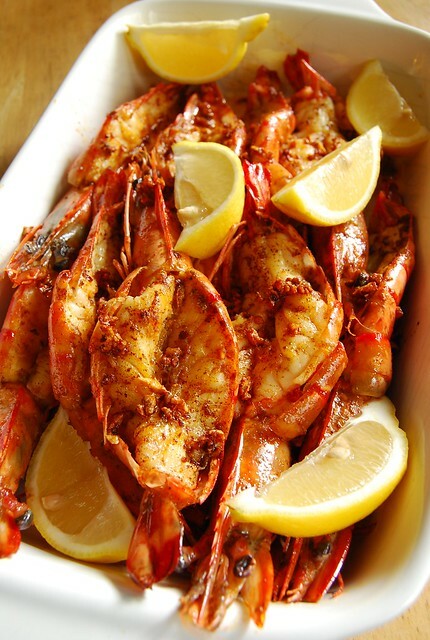 Prawns in garlic butter have long been a favorite of my family's and yours look just top-notch! Oh these prawns are perfect! I love how you cooked this, it reminded me of how my mom used to do her prawns with a dash of 'picante' ! I can just smell the aroma! Thanks for sharing,Joey ~ will bookmark this for Ash Wednesday which will be here before we know it! Hi Rosa! Yes, I love this combination too! Butter prawns for breakfast! Great. As you say, Saturday mornings are the best, providing my kids dont get up a "stupid oclock"
This could well be something to try in the slow cooker for a mid morning brunch out on the decking…. Once the sun comes out of course! Looks like it's easy to make. I will def try your recipe! Thanks for sharing! awesome recipe , succulent and perfect.